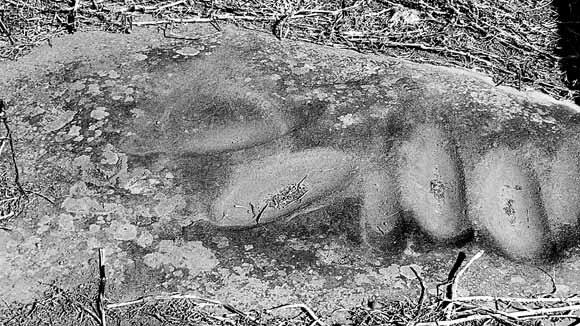 There are signs of thousands of years of human activity at Tocal. Grooves worn into rocks by grinding seeds and plants day after day, year after year, indicate Tocal was a popular camp site for the Aboriginal people. ‘Tocal’ is an aboriginal word, and at one stage it was thought to mean ‘ducks-a-plenty’ in the local Aboriginal dialect. However, the weight of recent evidence indicates Tocal simply means ‘big’ or ‘plenty’. The area with its river, creek and natural wetlands would certainly have been a plentiful food source, abounding in birds, fish and other animals. When James Webber moved onto Tocal in March 1822 it was occupied by the Gringai clan of the Wonnarua Aboriginal people. Below: Aboriginal grinding grooves within the homestead complex at Tocal.